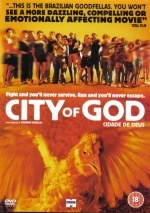 The City Of God is one of the most criminal places of Rio-de-Janeiro, many of the poor inhabitants live here in a constant fear of the criminals whose dealings are closely connected with the routine life of the city. Drug-trade, police negligence and an endless poverty are the damnation of these streets. Poor dark-skinned lad finds himself unable to join the criminal business due to his subtle mentality and becomes involved into the art of photography. The boy wants to become a professional photographer and to elude this vicious circle of crime, his neighborhood. In this worldwide acclaimed movie by Fernando Meirelles reality and style are intertwined in one shocking story. - 15 miles from paradise...one man will do anything to tell the world everything. Fight and you'll never survive..... Run and you'll never escape. - If you run it will get you. If you stay it will eat you.